Lawless America has created Lawless America state pages to meet the demand for fellow Nobodies to more easily connect with other Lawless America Revolutionaries from their state. The pages have initially been established on Facebook. www.YouTube.com/lawlessamerica also has state pages. State pages will also be added to LawlessAmerica.com. Please click to "LIKE" your state page if you are from that state or have had corruption dealings in that state. Let's try to keep then "LIKES" to those in each state so everything remains very focused. The Lawless America State Chairmen will be the administrators for each state page. 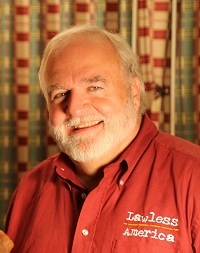 To find the complete list of Lawless America state pages, go to www.facebook.com/lawlessamerica. Click on "ABOUT." Then scroll to the bottom of the page, and click "SEE ALL" under the PAGES heading -- at the very bottom of the page. If you do not have a Facebook page, PLEASE PLEASE PLEASE register for one. Facebook provides an invaluable means of promotion for Lawless America and The Revolutionary Party.